The Oakland California Temple (formerly the Oakland Temple) is the 15th constructed and 13th operating temple of The Church of Jesus Christ of Latter-day Saints (LDS Church). During a January 23, 1961 meeting, plans for the temple were announced by David O. McKay. Ground was broken on May 26, 1962, with the cornerstone laid May 25, 1963, and dedication on November 19, 1964. 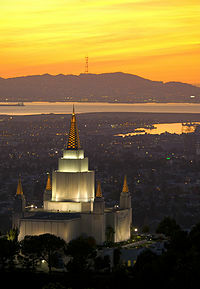 Located in the city of Oakland, California, at 4770 Lincoln Ave, it is the only LDS temple built with a modern five-spire design and exhibits an Oriental motif. Its architect was Harold W. Burton. The exterior of the temple is reinforced concrete faced with sierra white granite from Raymond, California. On the north and south faces of the temple are two decorative friezes; it is the last LDS temple to have such. The back (south side) is a depiction of Christ descending from heaven to the people of the American continent soon after his resurrection in the Holy Land. The front (north side) illustrates Christ preaching his gospel to the people. Within the front garden courtyard there is a statue of children in front of a bronze plaque bearing a scripture from 3 Nephi chapter 17, from the Book of Mormon, relating how Christ blessed the children during his visit to the people of ancient America. The temple sits on a prominent site in the Oakland hills and has become a local landmark. Through the front courtyard are stairways which lead to the temple terrace situated above the ground floor of the temple. From the temple grounds and terrace are views of the Bay Area, including downtown Oakland, the Bay Bridge, Yerba Buena Island, downtown San Francisco and the Golden Gate Bridge. The grounds are accented by flowers, palm trees, and a formal-style man-made river running from one fountain to the other. The temple was built on an 18.3-acre (74,000 m2) plot, has four ordinance rooms, seven sealing rooms, and has a total floor area of 95,000 square feet (8,800 m2). The site where the Oakland Temple now stands was inspected by David O. McKay, then second counselor in the First Presidency, in 1942. The 14.5 acres (59,000 m2) were purchased by the church on January 28, 1943. Ground was broken for the temple in 1962. On February 23, 2017 the LDS Church announced that beginning February 2018, the temple would close for renovations that will be completed during 2019. On December 18, 2018, the LDS Church announced that following anticipated completion of the renovations, a public open house is scheduled from 11 May through 1 June 2019, excluding Sundays. The temple is scheduled to be rededicated on Sunday, June 16, 2019.
Notable presidents of the temple have included Lorenzo N. Hoopes (1985–90) and Durrel A. Woolsey (1996–99). In the nearby Interstake Center, local members performed a Latter-day Saint pageant (an annual theatrical production) for many years. The pageant, commonly known as the "Temple Pageant," was a musical stage production rehearsing the history and legacy of the LDS Church. It was one of only a few "temple pageants" around the country; others include the Easter Pageant in Mesa, Arizona, and the Mormon Miracle Pageant in Manti, Utah. Until its retirement, it was the only such pageant performed indoors as well as the only one to be fully accompanied by a live orchestra. Initially, the pageant consisted of three acts performed over three consecutive nights; however, it was eventually shortened to an hour and a half. In November 2007, a letter sent to stake and mission presidents in the region from D. Todd Christofferson, then of the Presidency of the Seventy, indicated that the pageant would no longer be held. A map of the grounds of the Oakland California LDS Temple. The auditorium seats 1,600 people and has a 60-foot (18 m) stage. Besides the three resident organizations and the temple pageant, many Brigham Young University performing arts groups have performed in the auditorium. The Temple Hill Symphony Orchestra was formed in 1985. It has 52 members, about a third of whom are not Latter-day Saints. It has other sponsors besides the LDS Church and is a non-profit organization that offers free concerts. It is currently directed by John Pew. There is also a Temple Hill Public Affairs Council which seeks to use the resources on the location to raise awareness of the LDS Church and its mission. As of 2007, it was directed by Lorenzo Hoopes. The Temple Hill Choir and Behold Dance Collective—The Temple Hill Dance Company are also based here. ^ Rees, Bridget (June 5, 2007). "LDS Pageants". LDS Living Magazine. ISSN 1540-9678.